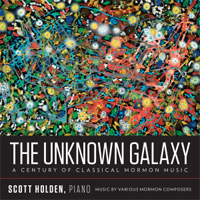 Description: “A Century of Classical Mormon Music” is the subtitle of this collection which includes composers from China and Spain as well as the U.S. Modernity intrudes sharply only when Sargent inserts some pungent late 20th-century sonorities with Chopinesque style while Tan’s “Silence Understood” is for prepared piano, allowing for some otherworldly soundscapes but the music itself is meditative. It was a bit of a jolt to read that Robertson’s tumultuous Etude was the result of the shock, fear and anger he felt after sneaking into a Hitler speech while studying in Berlin in 1933 and seeing the frenzied response of the crowd! Scott Holden (piano).